Adobe unveiled its cloud-centric Lightroom CC yesterday and announced that desktop Lightroom has been rebranded as Lightroom Classic CC. The company also stated that Lightroom 6 would be the final standalone version of Lightroom that doesn’t require a subscription backtracking on what the company said just a few years ago. 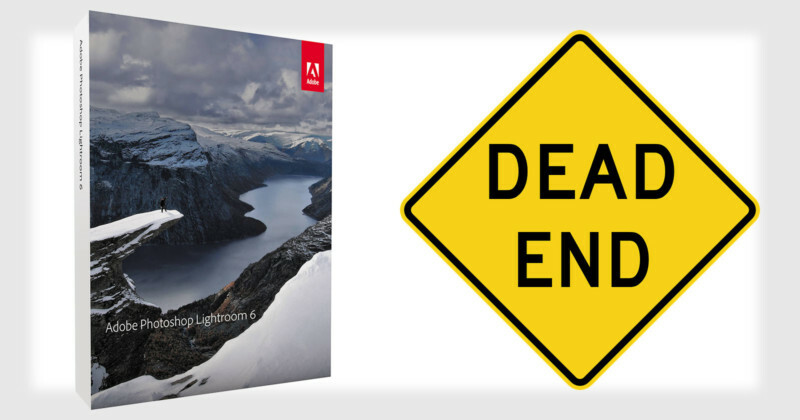 Photo Rumors points out that Adobe had once reassured photographers that standalone Lightroom wasn’t going anywhere. In a blog post published on May 6, 2013, Adobe said there wouldn’t be a new app called Lightroom CC and that traditional perpetual licenses would be offered indefinitely. Will there be a different version of Lightroom called Lightroom CC? was one of the questions, and Adobe’s answer was a simple No. And regarding whether Lightroom would be subscription-only after Lightroom 5, Adobe stated that Future versions of Lightroom will be made available via traditional perpetual licenses indefinitely. 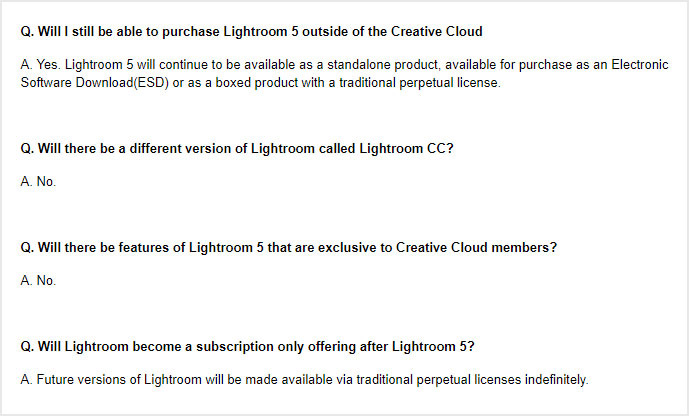 But after yesterday’s news, it’s now known that Lightroom will be subscription-only after Lightroom 6. Lightroom 6 is the last standalone version of Lightroom that can be purchased outside of a Creative Cloud membership, writes Adobe director of product management Tom Hogarty, who also wrote the 2013 blog post. There will not be a Lightroom 7 perpetual offering. Lightroom 6 will remain for sale for an undetermined amount of time, but will no longer be updated with camera support or bug fixes after the end of 2017. After 2017, Lightroom 6 will no longer be updated to support the RAW files generated by newer cameras, so the program will become less and less usable over time for serious photographers using the latest gear. Understandably, some photographers reacted to the news yesterday with disappointment, accusing Adobe of reneging on its prior promises. Adobe had indeed planned to continue offering new perpetual license versions of Lightroom indefinitely, but plans have changed based on customer feedback, an Adobe spokesperson tells PetaPixel. The feedback is related to the popularity of our Creative Cloud Photography plan. The $9.99/month Creative Cloud Photography plan has been very popular with customers, and we’ve seen strong adoption because of the value that the plan brings to photographers, the spokesperson says. With today’s updates and the addition of Lightroom CC and 20GB of storage, the Creative Cloud Photography plan is delivering even more value for photographers. Adobe has been setting new revenue records in recent years, and its stock has grown from around $45 when the 2013 blog post was published to $170 today. Photographers who wish to avoid subscribing to software may not be happy with the news of Lightroom going subscription-only, but moving to cloud subscription software has been a huge boon to Adobe’s business.